Beer and cider have become so much more than sweaty men sporting a hard earned thirst. These days our fave ferments come with all the finery (and glorious mouth swishing) of wine—and this pleases us to no end. The clan at GABS (The Great Australian Beer Spectapular) have picked up on this trend and understand a lukewarm Tooheys just won’t cut it anymore. Bless them right down to their barley-filled souls; they’re bringing us the best of the best with the GABS Beer, Cider & Food Festival. Held annually, the GABS festival brings together beer (and now cider) lovers from every ‘burb of Sydney to celebrate what is practically a national drink (Bart vs. Australia certainly thinks so) and this year, we’re congregating at Australian Technology Park. Punters can pop into the Dan Murphy’s Marketplace for a chance to meet the team behind their favourite, and soon-to-be favourite brews, taste rare concoctions or try a paddled selection of 120 festival-only beers (look for them at the ‘Kegtainer’ bars made from re-purposed shipping containers). Previous festival beer ingredients have included watermelon, chocolate and chilli housed in wooden barrels formerly home to tequila, wine or whisky. We’ve also heard rumour of a jam donut beer so keep your sugar-seeking eyes open. 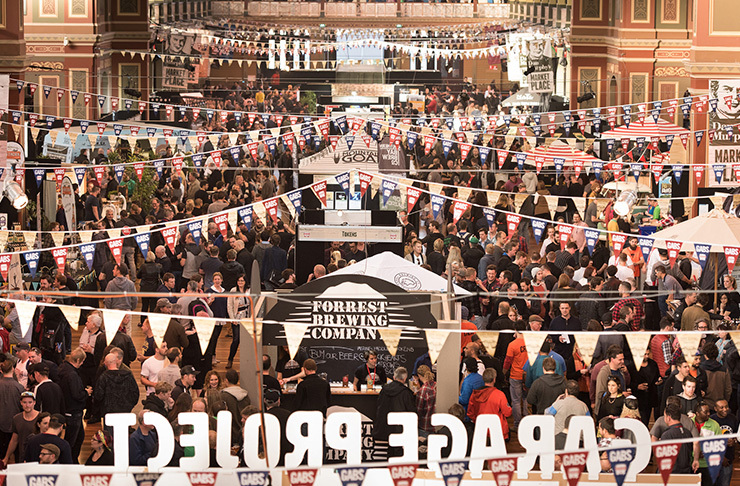 Ultimately, a total of 400 beers from 150 breweries, as well as numerous cideries from across the globe are sure to please. With great power comes great responsibility, and with great beer, comes even greater snacks. Head to the James Squire Food Market to find out which tasty morsel (or six) is paired with your current drink of choice. Going rogue on the recs? You’ll find festival regulars like Veggie Patch Van as well as Three Blue Ducks, Ze Pickle, Mr Bao, Salmon & Bear and more. Those with a childhood grudge to settle can try their hand at giant Jenga or silent disco (here’s to looking like a fool but enjoying a banger), tenpin bowling, table tennis and bean toss. There’ll also be performers from the Yak Ales Carnival and music group The Ale Capones may or may not cause you to recreate the foam-happy Pete’s Dragon tavern scene. We all know a mate whose had a go at home-brewing, or at least declared such an intention. Homeowners need not fear a bathtub full of hops, hopes and dreams as the GABS festival have free Craft College Q&A sessions thanks to The Local Taphouse. There’ll also be hands-on seminars hosted by Beer Diva Kirrily Waldhorn at Steel’s Food and Drink Experience but it’s first in, first served, so bums on seats guys. Finally, and most importantly, don’t forget to use the correct terminology. ‘Craft’ beer, ‘boutique’ cider, ‘yes’ I’d like another. Where: Exhibition Hall, Australian Technology Park, Locomotive Street, Eveleigh. When: Friday May 27th Saturday May 28th – Three sessions available. How much: Tickets cost from $36 (ticket only, general admission). Find out more here. Want more beer? Check out Beer DeLuxe in the directory.